And they were to be joined by 3 other passengers (or rather thieves). The equally burning question would probably be "How do you put 3 cows in a Wira?" To which the thieves would perhaps answer : "Open the boot, shove the cows in, and close it!" BUKIT MERTAJAM: After knocking out three cows using tranquillisers, three men shoved the animals into a Proton Wira in Sungai Lembu here in their grand theft plan. The thieves, in their 20s, had used a blowpipe to sedate the animals, which were fenced up in an oil palm estate, at about 1am on Friday. 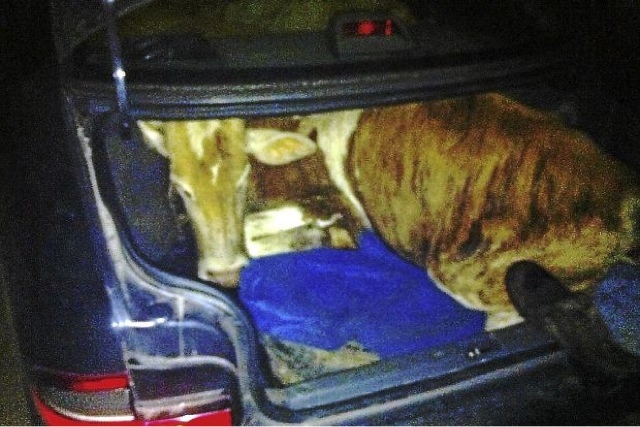 A witness, who declined to be identified, said he saw the thieves struggling to put the unconscious cows into the car which was without the backseat. He quickly alerted the voluntary patrol unit in the area. At the same time, one of the three men had gotten into the car and driven away, while the other two hopped onto two motorcycles and followed from behind. “As they were about to reach the main road, the patrol unit arrived and tried to stop them. “The driver rushed out of the car and hopped onto one of the motorcycles and fled,” he added. Villagers later took about three hours to free the dazed cows from the car. A police spokesman said the cattle owner had lodged a report, adding that the three men were suspected to be involved in other cattle theft cases in the area.